RHYS: Jan Burke was supposed to be my Wednesday guest, but alas, various factors, including my disappearing internet, did not cooperate, so I'm giving her the whole weekend to shine. So welcome to JRW Jan. I was at ALA and saw great piles of the new Jan Burke book DISTURBANCE, Obviously Simon and Shuster are excited about this and when I eard that it was a follow up to Bones, I was too. series in order, you may want to read Bones first. the Moths' way of letting her know they can reach her. to her life and provided her with an extended family. RHYS. Was Irene Kelly an alter ego when the series started? Is she still? whom I enjoy spending time. RHYS:You write about very dark subjects, darker than most women writers. yourself from your subjectmatter? Or are you just super tough? quickly point out that there are no dead children in Disturbance. having themes related to hope, justice, and forgiveness. moved on with her life, she still misses him. just knock back a shot of whiskey and go out after their attackers. front door, but they do it. They feel afraid, but act anyway. that allows me to feel hopeful. Passage Mystery Conference. Can you tell us a little about that? still take the time to browse its Website. Golden Gate Bridge from San Francisco. Broadbent on Developing Character and Dialogue. JAN: I've decided that I'm not going to say much about the next one yet. about them while they are in progress. is Spoilerville? Why did you start it? read the book are not be likely to accidently see them. can have some fun there. RHYS: Thank you so much for taking the time to visit us, Jan. I know your readers will be lining up for the new book. See you next week! Photo by Sheri McKinley Photography. I love that Jan talks so much about the emotional aspects of her work. Guess that's what most mystery readers (70-80% female?) like best. Besides the accurate portrayal of newspapers, though, I most enjoy the well-done, meticulous plots. Looking forward to DELIVERANCE. Side note: Since this JR is always commenting first, I need a shot of WRITE FIRST. I vote for another round soon. Jan, thanks for being with us! I love your books and am looking forward to Deliverance. 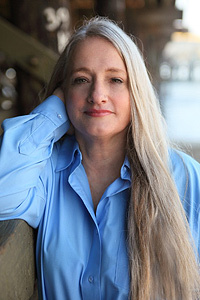 I'll be seeing you and Rhys at the Book Passage mystery conference next week, Jan - looking forward to it! BONES was one of the books I took a serious look at when I was writing my own fist novel. It's so scary. So I'm looking forward to reading DELIVERANCE an seeing where you took it. Hello Jan...how is it that we've never met?? Like Deb I'm so jealous that you, R and H will be at Book Passage for the mystery conference..one day I'll get to go! And I'm with you Jack...I need a shot of Write First. these days it's been Garden First. Jan, I meant to say what a great idea Spoilerville is!!! I'm checking it out asap. Oh, my goodness--Spoilerville is pure genius! Welcome, Jan! Rosemary, mayabe we can get Book PAssage to invite us...sigh. It sounds so great! Nice to see you here, Jan.
You all enjoy the conference. Thanks, Jungle Red folks, for including me and for your kind words. And I'm looking forward to seeing Rhys and Hallie soon. Oops, that was me getting the title wrong! Sorry, Jan! Dyslexia strikes again . 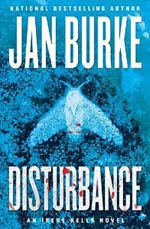 . .
Can't wait to read DISTURBANCE! I've just learned a lesson--NEVER post anything when stressed and my head is not quite there. I called Jan's book Deliverance--see, I knew it would be scary--and feel like a fool. Luckily Jan's fans know what it's called. And now I've corrected my mistake. Really not a problem -- thanks for including me in the Jungle this weekend! Thank you for sharing both your insights and your talent. I love Irene and I adore Frank...I think you are a wizard with characterization, where even the least-important players are clear and memorable. Your plots are outstanding, as well, but probably what I appreciate most is how much *heart* your stories have. You're so gifted, Jan, and so generous to let us enjoy those gifts. Thank you!